Peptide (C)EEAQLENETIG(S)SK, corresponding to amino acid residues 52-65 of human VPAC1 (Accession P32241). Extracellular, N-terminus. Homology Human - 13/14 amino acid residues identical; rat, mouse - 12/14 amino acid residues identical. 1-3. Anti-VPAC1 (VIPR1) (extracellular) Antibody (#AVR-001), (1:400). 4-6. Anti-VPAC1 (VIPR1) (extracellular) Antibody, preincubated with the control peptide antigen. Immunohistochemical staining of immersion-fixed, free floating rat brain frozen sections using Anti-VPAC1 (VIPR1) (extracellular) Antibody (#AVR-001), (1:100). 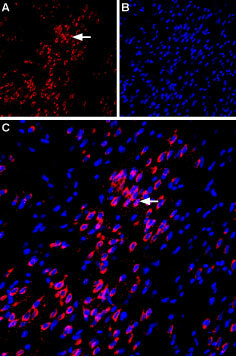 A. VPAC1 staining (red) is apparent in basolateral amygdala neurons (horizontal arrow). B. Cell nuclei in the same section are stained with DAPI (Blue). C. Merge of the two images. ___ Cells + Anti-VPAC1 (VIPR1) (extracellular) Antibody (#AVR-001), (1:20) + goat-anti-rabbit-DyLight-488. Cell surface detection of VPAC1 in live intact human HT-29 colorectal adenocarcinoma cells. A. Extracellular staining of live cells with Anti-VPAC1 (VIPR1) (extracellular) Antibody (#AVR-001), (1:25), followed by goat anti-rabbit-AlexaFluor-594 secondary antibody (red). B. Cell nuclei were visualized using Hoechst 33342 (blue). C. Live view of the cells. Vaudry, D. et al. (2000) Pharm. Rev. 52, 269. Gozes, I. et al. (2003) Curr Pharm Des. 9, 483. Laburthe, M. et al. (2002) Receptors Channels 8, 137. Laburthe, M. et al. (1996) Ann. N. Y. Acad. Sci. 805, 94. Usdin, T. et al. (1994) Endocrinology 135, 2662. Reubi, J.C. et al. (2000). Ann. N. Y. Acad. Sci. 921, 1. Said, S.I. (1991) Trends Endocrinol. Metab. 2, 107. Vasointestinal peptide (VIP) and pituitary adenylate cyclase–activating peptide (PACAP) belong to the glucagon hormone superfamily, which includes secretin, growth hormone–releasing hormone (GHRH), glucagon, glucagon-like peptides 1 and 2 (GLP-1 and GLP-2), peptide histidine methionine (PHM), and glucose-dependent insulinotropic polypeptide (GIP)1. PACAP and VIP effects have been described in the digestive tract, cardiovascular system, airways, reproductive system, immune system, endocrine glands, and brain2. VIP and PACAP share a common G-protein coupled receptor, VPAC13. VPAC1 is a membrane-associated protein and shares significant homology with members of the G-protein coupled class B receptor family, the most important of which is the presence of large N-terminal extracellular domains which contain 10 highly conserved amino acids including six cysteines, putative N-terminal leader sequences and several potential N-glycosylation sites4. In the CNS, VPAC1 receptors are abundantly localized in piriform cortex, cerebral cortex, suprachiasmatic nucleus, hippocampus, and pineal gland5. In peripheral tissues, VPAC1 receptors have been found in breast, kidney, liver, lung, prostate, spleen, and mucosa of the gastrointestinal tract6. VPAC1 mediates a large array of VIP and PACAP actions on exocrine secretion, hormones release, muscle relaxation, metabolism, fetus growth, tumor cells and embryonic brain development7. Anti-VPAC1 (VIPR1) (extracellular) Antibody (#AVR-001) is a highly specific antibody directed against an epitope of human VIP and PACAP receptor 1. The antibody can be used in western blot, immunohistochemistry, immunocytochemistry, live cell imaging, and indirect flow cytometry applications. It has been designed to recognize VPAC1 from mouse, rat, and human samples. Mouse carotid and femoral artery lysates. Ivic, I. et al. (2019) PLoS ONE 14, e0211433. Ivic, I. et al. (2017) J. Vasc. Res. 54, 180. Anti-VPAC1 (VIPR1) (extracellular)-FITC Antibody (#AVR-001-F). This FITC-conjugated antibody can be used to detect VPAC1 receptor in live cell flow cytometry.